Another similarity appearing between Islamic Iran and North Korea - price and availability of food. Iran is still far from Korean shortages but moving inexorably, though slowly still, in that direction. But we seem to be facing challenges of our own in America. Based on analytical details provided repeatedly by Glenn Beck on Fox News and his research team and experts he has contacted on the down-sliding, debt ridden economy, on the rising price of fuel, on the potential devaluation/crash of our currency, on availability of basic needs, our ability to pay for goods AND OUR OWN extensive EXPERIENCE with the revolution in Iran, please take heed. We DO NOT have any inside or behind the scenes private knowledge so we opine YOU decide on whether to listen or what you want to do. Food availability and price challenges could be coming to your neighborhood in the USA! You need to be warned to think about it, so you might want to consider buying and stocking NON-perishable essentials like salt, sugar, cooking oils, coffee, canned foods, canned broths and canned milk. Rice or oatmeal are good filler staples. Note that electricity may become sporadic or unaffordable so don't count on having refrigeration. Think outside that box. Gas cylinders will be needed for basic cooking on camping type single or double burners. In fact think "camping" rather than maintaining your current menus. It will be a matter of having nutrition for survival not tasty food as a pleasure. Also stock up on drinking water and toilet paper and perhaps paper towels as well as essential medications you require. Multi-vitamins may be an item to consider as your nutrition may not be what it is today. Make a list of items you use monthly and try to get a reserve of a year's worth of items for you and the whole family. Food prices may skyrocket fairly soon - perhaps in a matter of a few months though supermarket shelves may still have a supply to offer but - like in Zimbabwe - at prices nobody can pay. "Better safe than sorry" is not being an alarmist just makes good sense, specially as with so many still out of work, trying to put this together may take some time. And has the effect of a mini-stimulus that makes sense and is not a waste of money. Gas and diesel prices have skyrocketed because subsidies have been cancelled. Consumption of fuel has dropped dramatically as it has become unaffordable. puts a huge strain on families food budgets. Bread prices are just an example of the compound rise in food item costs, which has already put tomatoes, eggs, potatos, dairy products like cheese, milk or yoghurt and similar daily needs almost beyond the reach of many families. A YouTube video detailing food price rises with emphasis on dairy products made inside Iran quite some months ago was SCRUBBED off the Internet under pressure from the Islamic regime. How they justified a video by a citizen giving details of overnight food price increases as something YouTube should delete is mind boggling and perhaps points to White House pressure coming to bear. It was embedded on our site but failed to function after only a few days. There are those in charge in America who want to follow this kind of change and destroy us, too! Same Marxist-Islamic methods in progress for the last two years under Oba-Hussein. "I have this theory about Barack Obama. I think he's led a kind of make-believe life in which money was provided and doors were opened because at some point early on somebody or some group (George Soros anybody?) took a look at this tall, good looking, half-white, half-black, young man with an exotic African/Muslim name and concluded he could be guided toward a life in politics where his facile speaking skills could even put him in the White House. He was in the U.S. Senate so briefly that his bid for the presidency was either an act of astonishing self-confidence or part of some greater game plan that had been determined before he first stepped foot in the Capital. How, many must wonder, was he selected to be a 2004 keynote speaker at the Democrat convention that nominated John Kerry when virtually no one had ever even heard of him before? And then he had the great good fortune of having the Republicans select one of the most inept candidates for the presidency since Bob Dole and then John McCain did something crazy. He picked Sarah Palin, an unknown female governor from the very distant state of Alaska . It was a ticket that was reminiscent of 1984's Walter Mondale and Geraldine Ferraro and they went down to defeat. Now, nearly a full two (2) years into his first term, all of those gilded years leading up to the White House have left him unprepared to be President. Left to his own instincts, he has a talent for saying the wrong thing at the wrong time. It swiftly became a joke that he could not deliver even the briefest of statements without the ever-present Tele-Prompters. Far worse, however, is his capacity to want to "wish away" some terrible realities, not the least of which is the Islamist intention to destroy America and enslave the West. Any student of history knows how swiftly Islam initially spread. It knocked on the doors of Europe, having gained a foothold in Spain. Obama is a man who could deliver a snap judgment about a Boston police officer who arrested an "obstreperous" Harvard professor-friend, but would warn Americans against "jumping to conclusions" about a mass murderer at Fort Hood who shouted "Allahu Akbar." The absurdity of that was lost on no one. He has since compounded this by calling the Christmas bomber "an isolated extremist" only to have to admit a day or two later that he was part of an al Qaeda plot. He is a man who could strive to close down our detention facility at Guantanamo even though those released were known to have returned to the battlefield against America . He could even instruct his Attorney General to afford the perpetrator of 9/11 a civil trial when no one else would ever even consider such an obscenity. And he is a man who could wait three days before having anything to say about the perpetrator of yet another terrorist attack on Americans and then have to elaborate on his remarks the following day because his first statement was so lame. When anyone else would quickly and easily produce a birth certificate, this man has spent over a million dollars to deny access to his. Most other documents, the paper trail we all leave in our wake, have been sequestered from review He has lived a make-believe life whose true facts remain hidden. We laugh at the ventriloquist's dummy, but what do you do when the dummy is President of the United States of America? 1. Is the Obama administration ready with a forged long-form Birth Certificate as we speak? Specially with sycophant Abercrombie in the Hawaii Governors's seat? Don’t know about 9/11 conspiracy, but do know from DC source that an Administration team is working on perfecting a forgery of the long-form birth certificate. They plan on presenting it in a a month or so. The source is an FBI agent who has a drinking buddy from University of Illinois now in the Administration. Its second hand, but the source is supposed to be solid. They have already prepared the forgery with special paper and ink. The document was printed on a fully functional 1960 Heidelberger printing press located at a print museum in Toronto. Access was arranged by a trustee of the museum who is connected to a large Canadian banking/investment firm with major US interests. (Article scrubbed off the Internet). The blanks in the forged form were filled in with an old Underwood Manual typewriter bought at an estate sale in Skokie, IL. The raised seal was the easiest piece to fake, since you can buy a special order corporate seal from just about any online office supply store. The only reason they haven’t rolled out the foregery yet is that it is “seasoning” under mild UV light and a back and forth rotation between between a humidifier and a sauna. Get ready....one to two months tops. (One experienced printer and paper expert says it is impossible to age paper that way beyond visibly and certain chemical factors of real old paper would simply not be there). I also said they’d have to get a 1960s Printing Press, and indeed, by this information, looks like they found one. enroll at Franciscus Academy in Indonesia? enroll ar Punahou Academy in Hawai'i? enroll at Occidental College in California? enroll at Columbia College in New York City? enroll at Harvard Law School? (Some speculate that any orginal birth certificate (if it exists) has Barry Dunham as the name his mother used on it for him and the "father's name" part was left blank or has a name other than Obama). We are suppose to believe that he was conceived on the night of Kennedy's inauguration. It's an important date to those who planned when to put the pretend date he was allegedly born. For some reason they even made up the date of his birthday. For superstitious and cult types, dates are very important. The newspaper article they showed merely said that the Obamas of such and such address had a baby. It doesn't say where it was born. Grandma could have phoned/informed the paper of his birth and they printed the fact that he was born as she reported it to them. It doesn't say what country or hospital or anything else about where. The issue of Natural Born Citizen was brought against John McCain long before Barrack was nominated to the DNC as a Presidential Candidate. In fact, in order to place McCain on the ballot, the United States Senate went so far as to craft the Senate Resolution 511 proclaiming John McCain a Natural Born Citizen. There were six members on the committee for SR 511 and Chertoff sat in as an "expert" on the definition for Natural Born Citizen. Guess who two of those six members were - Hillary and Oba-Hussein himself. I'd like to know why no one has confronted him on signing his name to that definition of two US citizen parents when he claims to have been born of a non-citizen father. I (commenter) was at a Blockbusters on Saturday renting videos... there was a video called "Obama"... the two men next to me... were Arabs and I asked them why they thought Michele Obama headed home following her Visit in France instead of traveling on to Saudi Arabia and Turkey with her husband. They told me she couldn't go to Saudi Arabia , Turkey or Iraq ... I said "Laura Bush went to Saudi Arabia, Turkey and Dubai " They Said that Obama is a Muslim, and by Muslim law he would not be Allowed to bring his [non-Moslem] wife into countries that accept Sharia Law. Did you see Obama in the past year or two apologizing to Cubans for something which occurred "four months after he was born"? He was allegedly born August 1961. Bay of Pigs was April 1961. He isn't who he says he is -- the records to prove he is who he says he is -- birth, scholastic, financial, passport--are all verboten to der volk (sealed away from we the people). 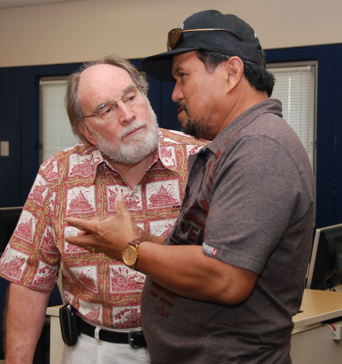 Although Hawaii's newly elected Democrat governor, Neil Abercrombie, has recently given a flurry of high-profile media interviews condemning "birthers" who question Barack Obama's constitutional eligibility to occupy the Oval Office, suddenly he is declining to answer a few hard questions. Abercrombie, 72, a former member of the U.S. House, may be trying to quell the surge of doubt among Americans – polls show nearly six in 10 doubt Obama's own eligibility story – by promising he will try to release additional records (???) on Obama from his state's Department of Health vault. He has, in just recent days, expressed his disdain toward "birthers" in the New York Times, the Los Angeles Times, the Chicago Tribune, on CNN, as well as the local Star Advertiser and Hawaii News Now. His startling remarks appear to be in response to the recent polling results as well as the rapidly growing list of high-profile personalities and leaders publicly raising questions about Obama's eligibility. Even as stalwart an Obama supporter as MSNBC host Chris Matthews is now urging that Obama release his long-form hospital-generated birth certificate to assist Abercrombie's campaign against "birthers." "I am not a birther. I am an enemy of the birthers," Matthews said. But, he added, "Why doesn't the president just say, 'Send me a copy right now?' Why doesn't Gibbs and Axelrod say, 'Let's just get this crappy story dead?' Why not do it? ... If it exists, why not put it out?" Matthews was joined by Clarence Page of the Chicago Tribune and David Corn of Mother Jones, both of whom agreed with Matthews' call for Obama to publicly release the document, which to this point has remained tightly under wraps. But Abercrombie won't talk with WND, which has reported more on the controversy than any other news source in the world. "It [the Obama birth certificate controversy] is an insult to his [Obama's] mother and to his father; they were my friends, and I have an emotional interest in that," Abercrombie told the New York Times in a telephone interview Thursday. "It's an emotional insult. It is disrespectful to the president; it is disrespectful to the office." But this week, in e-mails from his press secretary, Abercrombie refused to be interviewed by WND. "The governor did an interview over a week ago in which this topic [Obama's eligibility to be president under Article II, Section 1 of the Constitution] was raised," Donalyn Dela Cruz, Abercrombie's press secretary, said in an e-mail to WND. "He [Abercrombie] has been on vacation since Saturday and is unavailable. Hope this helps you understand. You are in no way being singled out as your e-mail suggests," she said. But despite the denials, Dela Cruz did not respond when WND followed up with a request for an interview with Abercrombie at the governor's convenience after he returns from vacation. It was just last week that Abercrombie himself injected new urgency into the ongoing controversy over Obama's birth certificate when the Star Advertiser reported the governor has been talking with the state attorney general's office and the director of the state Health Department to see how he can bypass Hawaii's privacy laws and release more information about whatever Obama records exist there. Interestingly, the new governor's links to the controversy go way back. Although he has acknowledged he was not present at the still-unidentified hospital in Honolulu to witness Obama's birth, Abercrombie long has claimed he socialized with Barack Obama Sr. and Ann Dunham Obama when Barack Obama Jr. was yet a baby. "Maybe I'm the only one in the country that could look you right in the eye and tell you, 'I was there when the baby was born,'" Abercrombie told the Chicago Tribune in an attempt to provide personal testimony to buttress the argument Obama was born in Hawaii as he has long claimed. Abercrombie was a graduate teaching assistant in sociology at the University of Hawaii when Barack Obama Sr. arrived in 1959 from Kenya to enroll as the first African-born student in the university's history. The problem with Abercrombie’s testimony is that Barack Obama Sr. and his wife, Ann Dunham, did not live together as man and wife with their baby son as Abercrombie claims to have witnessed. WND has published transcripts from the University of Washington in Seattle that prove Ann Dunham was enrolled in extension classes there, across the Pacific, within three weeks of the baby's birth. WND further has documented Ann Dunham's Seattle address in authoritative Seattle street directories from the period and interviewed Barack Obama Jr.'s babysitter in Seattle to further document the presence of Ann Dunham and her baby in Seattle, not Hawaii as Abercrombie has claimed. In August 1961, when Barack Obama Jr. was born, Barack Obama Sr. maintained a separate address on 11th Avenue, in Hawaii. There is no documentary evidence that Barack Obama Sr. and Ann Dunham ever lived at the same address together as man and wife. (Alan note: Michelle Obama has publicly stated that Obama's mother, Ann Dunham, was "very young, very single (unmarried) when she had him). Moreover, university transcripts from the University of Washington and the University of Hawaii demonstrate that Ann Dunham remained in Seattle, fully enrolled in university courses, until she returned to Hawaii in 1962 to re-enroll in the University of Hawaii after Barack Obama Sr. had left Hawaii to attend graduate school at Harvard in Cambridge, Massachusetts. Nobody invited to wedding of Obama's parents? In actuality, it isn't clear Obama's parents were married, since official records never have been produced showing a legal ceremony took place. No wedding certificate or photograph of a ceremony for Dunham and Obama Sr. has ever been found or published. In his book, "Barack and Michelle: Portrait of an American Marriage," former Time magazine contributing editor Christopher Anderson elaborates: "There were certainly no witnesses (to the alleged civil marriage ceremony on Maui in 1961 between Obama's parents) – no family members were present, and none of their friends at the university had the slightest inkling that they were even engaged." Anderson further quoted Abercrombie, a self-admitted friend of Barack Obama Sr. and Ann Dunham in 1961, as saying that "nobody" was invited to the wedding ceremony. Obama himself, on page 22 of his autobiography "Dreams from My Father," wrote of his parents' wedding: "In fact, how and when the marriage occurred remains a bit murky, a bill of particulars that I've never quite had the courage to explore. There's no record of a real wedding, a cake, a ring, a giving away of the bride. No families were in attendance; it's not even clear that people back in Kansas were fully informed. Just a small civil ceremony, a justice of the peace. The whole thing seems so fragile in retrospect, so haphazard." WND has published a photo of Barack Obama Sr. at a University of Hawaii student party that he attended without his "wife", Ann Dunham; the photo clearly shows his left hand absent a wedding ring. WND also reported on a letter Barack Obama Sr. wrote from Hawaii to his political benefactor in Kenya, Tom Mboya, in May 1962, discussing his wife, but he does so without mentioning Ann Dunham, his Hawaiian bride and the mother of the president, Barack Obama Jr.
Toward the end of the 1962 letter, Obama wrote, "You know my wife is in Nairobi there and I would really appreciate any help you may give her." Clearly Barack Obama Sr. is referring to his first wife, Kezia Aoko, whom he had married in 1954 when he was eighteen years old while she was pregnant with their first child. He instructs Mboya that his wife Kezia was then staying with her brother, Wilson Odiawo, in Nairobi. Two Hawaii newspapers published feature articles in June 1962, the month Barack Obama Sr. left Hawaii to attend classes at Harvard, that profiled Barack Obama Sr. in considerable detail, but make no reference to his wife in Hawaii, Ann Dunham, or his then 10-month-old infant son, Barack Obama Jr.
During the 2008 presidential campaign, Abercrombie told the Chicago Tribune he remembered Barack Obama Sr. and Ann Dunham as participating in "long coffee house sessions" while Barack Obama Sr. was attending the University of Hawaii. 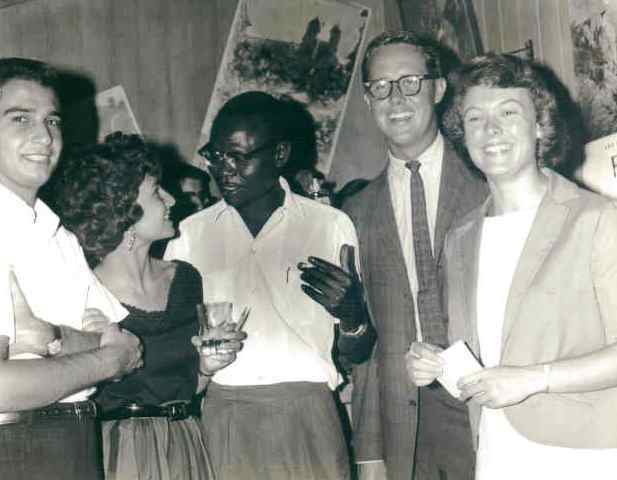 The Chicago Tribune story further reported that on a trip to Africa years later Abercrombie caught up with Barack Obama Sr.
"He [Barack Obama Sr.] was drinking too much; his frustration was apparent," Abercrombie told the newspaper. "To Abercrombie’s surprise, Obama never asked about his ex-wife or his son," Tribune national correspondent Tim Jones wrote. Just last year, Abercrombie played a role in another Obama birth controversy when he read a letter at a Kapi'olani Medical Center centennial dinner in Honolulu that supposedly was authored by President Obama, claiming Kapi'olani as his birth hospital. As WND reported, the letter read by Abercrombie and initially displayed on the Kapi'olani website turned out to be a computer-created likeness of a letter using HTML code, the building blocks of Internet websites, not an actual paper letter. 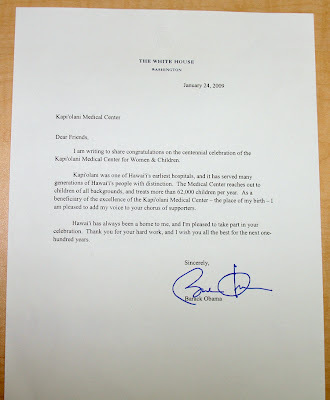 The Kapi'olani Medical Center for Women and Children in Honolulu originally posted on its website this HTML-created version of a letter supposedly written by Barack Obama in which he states he was born at the facility. Kapi'olani has since removed this image, and the White House has remained silent on its content. When pressed on the matter, Kapi'olani officials eventually sent WND a photograph of a paper letter purportedly written by Obama, though the White House has still not confirmed its authenticity or content. Hospital officials told WND they "know" the letter must be from Obama because it was brought to them by then-Congressman Abercrombie. 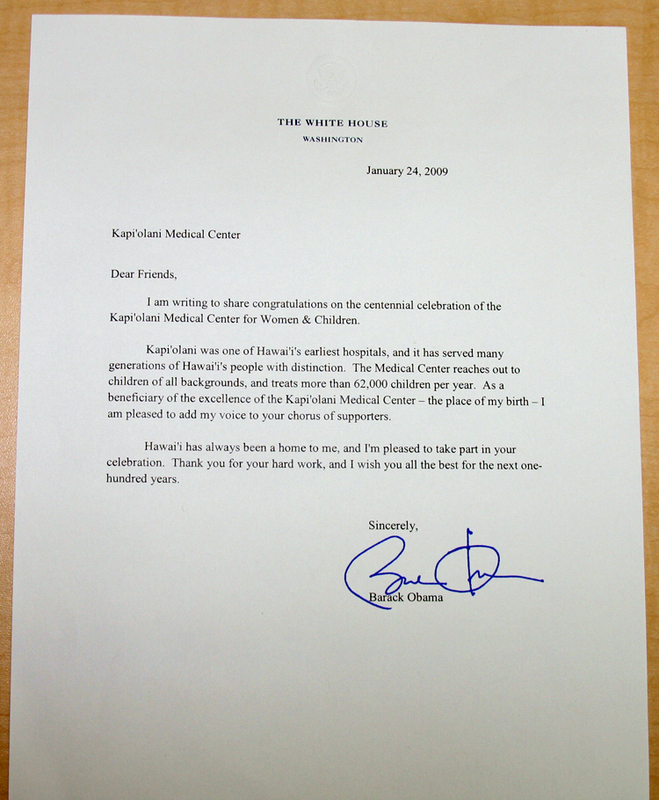 A photograph taken by the Kapi'olani Medical Center for WND shows a letter allegedly written by President Obama on embossed White House stationery in which he declares the Honolulu hospital to be "the place of my birth," The hospital, after publicizing the letter then refusing to confirm it even existed, is now vouching for its authenticity, but not its content. The White House has yet to verify any aspect of the letter. Also in 2009, WND documented that Obama and his supporters first claimed he was born at Queens Medical Center in Honolulu, before the story changed to Kapi'olani and Internet articles claiming Queens as Obama's birth hospital were cleansed to substitute Kapi'olani instead of Queens as the birth hospital reference. During his gubernatorial campaign, Abercrombie blasted WND for publishing a report that Abercrombie was listed as a member of the U.S.-based Marxist-oriented Democratic Socialists of America (DSA). Trevor Loudon of the New Zeal blog, a researcher on communism, uncovered the November-December 1990 issue of the Democratic Socialists of America's official magazine, "The Democratic Left," that listed Abercrombie as a member of the party. The magazine stated the group's political action committee endorsed two congressional candidates, "DSAer Democrat Neil Abercrombie seeking to regain the House seat representing Honolulu and Vermont independent candidate Bernie Sanders." Louden also documented that Obama attended Socialist conferences in New York in the early 1980s at the Cooper Union, the usual venue for the annual DSA-organized Socialist Scholars Conferences. Stanley Kurtz, in his book, "Radical-in-Chief: Barack Obama and the Untold Story of American Socialism," noted on page 63 that Barack Obama's name appears on a large list of names and addresses in a folder labeled "Socialist Scholars Conference," in the records of the Democratic Socialists of America. From analyses of these lists, Kurtz concluded that Obama pre-registered for the Second Annual Socialist Scholars Conference held on April 19-21, 1984, at the Boro of Manhattan Community College, CUNY, in New York. WND has reported on multiple legal challenges to Obama over his status as a "natural born citizen." Some of the lawsuits question whether Obama actually was born in Hawaii, as he insists. If he was born out of the country, Obama's American mother, the suits contend, was too young at the time of his birth to confer American citizenship to her son under the law at the time. Adding fuel to the fire is Obama's persistent refusal to release documents that could provide answers and his appointment of lawyers to suppress all requests for his documentation. Time out! Christmas is an appropriate time to take a break from the political and social battles that dominate the landscape the rest of the year. After all, it's still the nation’s most important holiday as far as Americans are concerned, edging the Fourth of July. More than eight-out of ten Americans celebrate Christmas and 70% do so primarily as a religious holiday honoring the birthday of Jesus. Among those who celebrate Christmas, 81% believe Jesus Christ is the son of God sent to Earth to die for our sins. But the commercial aspects of the holiday season add a strong element of stress to this peaceful time of year. Our final shopping survey late last week found that one-in-three adults still had holiday gift shopping left to do with only a couple days until Christmas. Seventeen percent (17%) hadn’t even begun shopping yet. That stress probably helps explain why 45% of Adults say they are having difficulty getting into the Christmas spirit this year. Speaking of spending, more Americans are confident about using their credit cards for purchases on the Internet this year in spite of an increase in the number of adults who say they've been the victims of credit card theft online. Despite the busy shopping season, fewer Americans with credit cards think they'll miss a payment in the next six months, compared to past surveys. Still, Americans overwhelmingly agree that credit cards entice people into spending money they don't have. Eighty-one percent (81%) think that most Americans need to cut back on credit card spending but only 36% think they personally need to cut back. While consumers have indicated slightly less reluctance to spend this holiday season, most voters still don’t think the government has it right when it comes to the economy. Just 24% think the current policies of the federal government have put the U.S. economy on the right course, a finding unchanged since September when President Obama made the claim. The Rasmussen Reports Consumer and Investor Indexes, which monitor daily confidence in those groups, showed little movement over the past week but still show economic confidence remains slightly higher than it was a year ago. Voters continue to send mixed signals about the $787-billion economic stimulus plan approved last year by Congress, even as spending for some portions of the plan begin to run out. For the first time since Democrats in Congress passed the health care bill in March, a majority of voters believe the measure is likely to be repealed. Voters have consistently for months favored repeal and have predicted the bill will drive up health care costs and the federal deficit. With the national unemployment rate at 9.8 percent, the president in a recent meeting with top U.S. business leaders urged them to use some of their ample cash reserves to create new jobs, and voters think that’s a good idea. But they draw the line at the government making the businesses spend their money that way. Most voters think the most important role for government, in fact, is to protect their individual rights. But right now many voters are angry at the government’s policies and question their constitutionality. While the midterm elections initially brought some good will to the voter ratings for the top congressional leaders, the subsequent month seems to have taken it away. Ratings for the four leaders as the current session of Congress draws to a close have now fallen back to their pre-election levels, with Democratic leaders Nancy Pelosi and Harry Reid unpopular with most voters and the lesser-known Republican leaders John Boehner and Mitch McConnell earning mixed marks. It will be interesting to see how those numbers move once Republicans take over the House next month and Boehner replaces Pelosi as speaker of the House. For the second week in a row, just 23% of Likely U.S. Voters say the country is heading in the right direction. This remains the most pessimistic finding since January 2009. Unhappiness with the government’s policies and the direction of the country prompted the rise of the Tea Party movement that has been widely credited with playing a major role in Election 2010. New Rasmussen Reports numbers give a clearer picture of who makes up the movement at year’s end. Most voters expect that the grass roots movement will have as much, if not more, influence on the 2012 political campaigns. Tea Party members are much more emphatic: 79% expect their movement to play a bigger role in 2012. Scott Rasmussen talks about the Tea Party’s anticipated role in the next national elections in a new video. At week’s end, the Rasmussen Reports daily Presidential Tracking Poll found that 46% of voters approve of the job Obama is doing, while 53% disapprove. 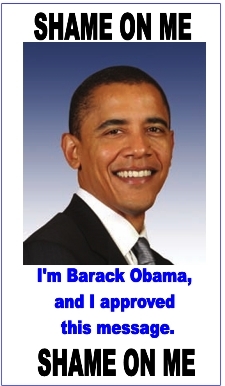 His approval ratings have remained remarkably stable throughout the entire year of 2010. -- Republicans hold a seven-point lead over Democrats – 45% to 38% - on the Generic Congressional Ballot for the week ending December 19. -- The Senate late Wednesday approved the START Treaty that calls for a reduction in the nuclear weapons stockpiles of both Russia and the United States, but only 27% of voters trust Russia to honor the nuclear weapons agreement. -- Though a sizable number of voters view the religious faith of political candidates as important, they don’t want their local religious leaders telling them who to vote for. Voters have mixed feelings about how much influence religious leaders have when it comes to U.S. government policy, but very few believe most politicians put their religious faith first. -- Americans overwhelmingly say major entertainment awards don't determine what movies or TV shows they watch or what music they buy. -- The New England Patriots were the first team in the National Football League to punch their ticket to the playoffs, and now one-in-three football fans expects they will win this year’s Super Bowl. -- Two of the more compelling stories in the National Football League this year are the resurrection of Michael Vick’s career and the impending end of Brett Favre’s. A survey of 3,300 professional football fans shows that 47% view Vick favorably, while 55% see Favre in a favorable light. -- There has been much controversy over the new National Football League helmet-to-helmet contact rules, but a strong majority of professional football fans support these safety penalties. As always, we invite you to check out the benefits of Platinum Membership and visit the Rasmussen Reports home page for the latest current events polling. Farsi/Persian YouTube Video in the Multilingual section complaining that while workers cannot afford to put food on their family table, the criminal regime uses that money to refine uranium. Parallels the Obama regime here in the USA in policy and mindsets but with different details of implementation. HAVE WE LOST THE SPIRITUALITY OF GOD IN OUR RELIGIONS? 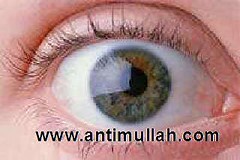 How sad that in following our chosen religions of various kinds and of competing various flavors of each category, various denominations Christianity - which follow Christ, multiple variations of Islam (not just Shia or Sunni) all bowing to Allah and so on, humanity appears to LOSE or forget the main thread. The spirituality of the deity or Creator - by whatever name we call it. With special thanks and best wishes to contributor S.J. 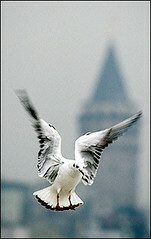 for many great texts and graphics throughout the year and many other persons sending articles in English and Persian. Too many to post but we read them all and learn. And best wishes to our visitors from over 125 countries in some 40 different web browser languages, whose dropping by are the only reward for our efforts. Thanks. We may not all, nor always, agree but we inhabit the same planet and can present and share our views here without bloodshed. Be well, be happy and prosper. NOTE: Nineteen of 20 U.S. residents celebrate Christmas, including 80 percent of non-Christians... (yet a very prominent person in charge insists we are NOT a Christian nation). A majority of those surveyed said their celebrations include religious activities, with 62 percent going to church on Christmas Eve or Christmas Day, 65 percent including religious symbols in their decorations and 78 percent saying they take some time to reflect on Christ's birth. While a Moslem student, under Oba-Hussein's support of Islam, sues a teacher for mentioning ham (food) in class and parents being asked to sign permission slips for their children to recite the Pledge of Allegiance to our nation in school, our Marxist- Islamist President ignores our safety and security and pushes through a HORRIBLY flawed START nulcear treaty with Russia (which out-maneouvered him in the details), prefering to push his self-gratifying aims and allowing America to face destruction by HIS actions. While his Homeland Security denies any problems on our borders, where admittedly MILLIONS of illegal entries happened without them being checked or asked for identification, where not just drugs but biological weaponry crosses with impunity but so do TERRORISTS! Wikileaks has divulged how the Obama Administration knew that Manuel Zelaya was an anti-democratic anti-Semitic pig whose goal was to become ruler for life like his buddy Hugo Chavez. But, Team Obama decided to support him for the greater good of Latin American relations. Barack Obama even cut off aid to Honduras in order to appease tyrant Hugo Chavez. Either Obama and his team - formal or the czars - are a total bunch of MORONS or they have an anti-America agenda by supporting , facilitating and encouraging our enemies - whether the Marxist ones like Chavez or the Islamic ones who have infiltrated (through his help) the highest levels of our government and high positions in our MILITARY. 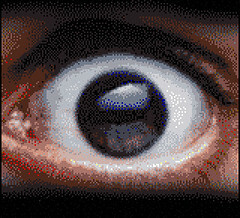 The equally idiotic Democrat Majority in the now FORMER Congress, that demanded we pass Bills to see what is in them (not knowing themselves for what they were voting) voted to pass the totally flawed START treaty (with a dozen traiterous Republicans) that now prevents us from defending ourselves against EMP (electro-magnetic pulse) nuclear weapons that can reach us from Venezuela. Note: EMP's do not kill or easily harm humans BUT wipe out electronic circuitry (in factories, banks, vehicles, traffic light controls, even your microwave oven, thus bringing commerce, transporation and financial structures to a halt and destroying America more certainly - or at best as certainly - as Hiroshima type of explosive weapons. With Oba-Hussein's real track record, not his self-proclaimed one, is it any wonder that approaching on nearly half of Americans think he is a Moslem, not a Christian like 95% of them, and does NOT share the same ideals and principles and love of America they do. His actions underline and give credence to this opinion! Note: Iran Shahab 3 and newer Shahab 4 missiles can EASILY reach the southern part of the USA and Iran is spanning the globe to find and hire nuclear scientists to develop nuclear WEAPONS capacity. Iran Just Shipped Missiles to Venezuela. Hello? Is This Thing On? A massive security threat just blossomed, and you'd be hard-pressed to find an MSM (main street media) or administration official who cares. Recent revelations about hostile incursions into South America have raised alarm in those who care about U.S. interests and security, particularly in America’s hemisphere. They have also raised questions about whether the Monroe Doctrine — America will tolerate no hostile incursions in her own hemisphere — is dead. These revelations have been, for the most part, ignored by those who care little for American sovereignty and security, such as the MSM and apparently the Obama administration. Among the two most alarming revelations is the already completed sale and delivery, to Venezuela by Russia, of nearly 2,000 advanced, shoulder-fired anti-aircraft missiles capable of hitting aircraft as high as 19,000 feet. Equally and perhaps more alarming is an October agreement between Iran and Venezuela. The agreement establishes a joint ground-to-ground missile base on Venezuelan soil and calls for the sharing of missile technology and the training of technicians and officers. In addition, Venezuela may use the missiles as it chooses for “national needs” and in case of “emergency.” Several types of missiles will be deployed, giving Venezuela the ability to strike targets throughout South and Central America and throughout the U.S. The dangers arising from the Marxist, cult-of-personality rule of Venezuelan strongman Hugo Chavez are many. These weapons are only the largest and most destructive purchased or finagled by Chavez. He has also purchased an enormous number of Russian assault rifles — the real thing, fully automatic military rifles, not the non-existent “assault weapons” of gun control imaginations and press releases — and related weapons and ammunition. Keep in mind that these are only the sales and transfers about which American authorities and the public are aware. With these weapons, Chavez can dominate the region. The consequences for U.S. and hemispheric security should be obvious to those who care about such things, but again, seem to entirely escape the Obama administration. But there are more direct, immediate threats. Several pundits have suggested that Venezuela’s shoulder-fired ground-to-air missiles might be carried into the U.S. if they were broken down into smaller pieces. Nonsense. Such weapons are self-contained and come complete with their own hardy, weatherproof hard cases which are easily small enough to be smuggled across the southern border without further disassembly. Anyone familiar with the vast size and wildly varied terrain of our southern border, compared to the small number of Border Patrol officers assigned to guard it, understands that smuggling anything across the border, including entire vehicles and thousands of people, is in many places merely a matter of walking across. Many are unaware that environmental regulations prevent the Border Patrol from doing what they are charged to do — patrol — in large areas. Also little known is the federal land grab the Democrats hope to sneak into law in the current lame-duck session of Congress that would greatly increase the number and acreage of federal lands and related environmental restrictions, making even more of the border region off limits to the Border Patrol — but certainly not to terrorists, drug smugglers, and illegal aliens. 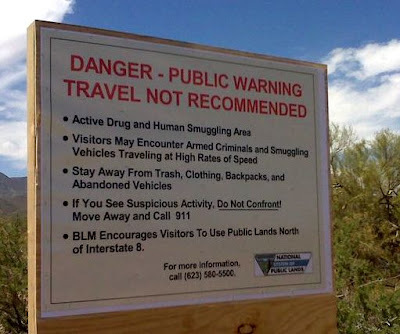 So out of control is the border that in some areas of Arizona, the federal government has posted signs advising Americans that drug cartels and human smugglers have taken control, warning that they should stay out for their own safety. To date, the Obama administration’s primary response, apart from surrendering control of American territory, has been to sue Arizona for daring to try to protect its citizens by passing a law that mirrors federal law. A few hundred troops have been sent here and a few hundred there, but these troops are not armed for battle and empowered to capture those who would harm us. It must be assumed as fact that Chavez is not only able but more than willing to equip terrorists and drug cartels, organizations with whom he has long-standing relationships, with weapons including shoulder-fired anti-aircraft missiles. His agreements with and public embrace of Iran, the single most active state sponsor of terrorism already responsible for the loss of an untold number of American lives, leaves no room for doubt. It would be surprising if such weapons, accompanied by terrorists, were not already on American soil. American commercial airliners are uniquely vulnerable to such weapons. Most vulnerable on takeoff and landing, slow-moving aircraft are easy targets, targets that will crash in the heavily populated suburbs surrounding most modern airports, racking up even higher death tolls. A few individual attacks could all but completely paralyze American commerce and wreck an economy already brought to its knees by two years of Obamanomics. Coordinated, simultaneous multi-city attacks could easily exceed the 9/11 death toll and would not require the attackers to become martyrs. Designed to be used by conscript troops in the field with little training, such missiles can be prepared, shouldered, and fired within seconds. A terrorist might simply step out of a vehicle along the periphery of an airport, shoulder and sight the missile, fire, and step back into the vehicle. By the time the missile strikes its target, he would already be driving away from the area, alive and ready to strike again. We have been fortunate that the FBI has recently intercepted a number of homegrown terrorist bomb plots. However, missile attacks need not involve anyone currently living in America. A sufficient number of terrorists could simply slip across our southern border and drive to their assigned points of attack. Such attacks would be virtually impossible to intercept. In addition, the Russian missiles now in Venezuelan hands are so common as to render it very unlikely that an attack could be traced back to Chavez. The same would be true of any small arms smuggled across the border to be used in attacks at shopping malls, theaters, schools, or other places where large numbers of potential targets congregate. Medium-range ground-to-ground missiles based in Venezuela are another matter entirely. Armed only with conventional explosive warheads, there would be little motivation for Venezuela or Iran to use them, as even under Barack Obama, massive retaliation would be at least possible. The equation is swung more in favor of use with biological or chemical warheads. But with nuclear warheads, use becomes even more likely. What is almost certain is that nuclear warheads would allow substantial blackmail capability, giving Iran and Venezuela a free hand not only in South and Central America, but in the Middle East as well. And all that is apparently keeping Iran from producing such warheads is a computer virus. We have missile defenses, but in this situation they cannot save us. One of the advantages for America, so to speak, of a Soviet missile attack was the 30-minute time from launch to impact, providing substantial time to detect and several opportunities to destroy an incoming missile. The shorter the time frame of missile flight, the fewer the opportunities. Ideally, missiles should be killed during the boost phase while still over enemy territory by such means as airborne laser platforms, platforms for which the Obama administration has cut funding. After the boost phase, missiles become harder still to locate and shoot down — but we do have limited capability to do this. As they are falling back to Earth, we have substantial capabilities, such as the land-based Patriot system and various shipboard systems. But unfortunately, their range is limited. They are area defense weapons. If they’re not in the right place at the right time, no defense. Most such systems are currently protecting our troops and allies. And of course, Mr. Obama has all but ended advancement in design, testing, and deployment of missile defense systems. The obvious response is to locate and obliterate as many of Venezuela’s anti-aircraft defenses, including shoulder-fired missiles, as possible and as often as necessary. Any attempt to build military installations in concert with Iran should likewise be met with utter obliteration. The chance of this occurring under President Obama is essentially zero — that is why we are facing a growing crisis, one barely mentioned by the MSM and apparently ignored by the Obama administration. Weakness invites war; strength deters it. Never has America been stronger, with greater and more overpowering war fighting technology, and never has she had weaker, more ineffective leadership. Were this not so, what nation would dare America to repeat, even exceed, President Kennedy’s response to the Cuban Missile Crisis? If Barack Obama allows such blatant threats in America’s backyard, what if anything could possibly provoke him to act in her defense? 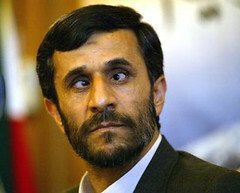 Hugo Chavez and Mahmoud Ahmadinejad believe the answer is nothing. Mike McDaniel is a former police officer, detective, and SWAT operator. BUT MORE SHAME ON YOU AMERICA FOR HAVING BROUGHT HIM INTO A POSITION WHERE HE CAN DO ALL THIS. THE CHANGE YOU NEED IS TO REMOVE THIS INTERNAL THREAT! $175 million to maintain an unused monkey house!!!!. $1.8 million for a museum dedicated to old Las Vegas signs. $615,000 to digitize a Grateful Dead collection. And $823,200 to study genitalia washing in South Africa. Those are just some of the projects that Sen. Tom Coburn (R-OK) uses as examples of government waste in his annual “Wastebook” report released today. “As you look at these examples, ask yourself: at a time when we are borrowing over $44,000 for every person in the country, are these items a priority and are they a federal responsibility?” he encourages readers. “Many taxpayers will no doubt agree that the wasteful spending uncovered in this report is not what they had in mind when they filed their taxes in April. and $997,766 to install poetry at zoos nationwide. RELIGION OF PEACE OR GRUESOME HUMAN PIECES? A lunatic woman who happened to be Moslem or a woman driven to crazy acts by OUTDATED Islamic tenets? Neighbours of a mother arrested after her four-year-old daughter was killed as an apparent religious offering told how they heard screams from the family's flat. Nusayba Bharuchi's corpse was found stabbed to death in the kitchen with her heart and other organs cut out and strewn around her flat and lying next to her mother, Shayna. The 35-year-old woman was allegedly chanting verses of the Koran as her daughter's disembowelled corpse lay next to her in the home in Clapton, East London. Enlarge Crime scene: Shayna Bharuchi, 35, was allegedly sitting in a her kitchen chanting verses of the Koran as her daughter Nusayba's disembowelled corpse lay next to her. The woman, believed to be from Somalia, had her MP3 on full blast as she listened to the Muslim holy book. The mother, who is understood to have two teenage children of 14 and 16, has since been sectioned under the Mental Health Act and is in a secure unit as police yesterday continued to guard the third-floor premises on the estate. The gruesome scene was discovered by the girl's father, Jerome Negney, when he arrived home to the flat on Thursday to find his partner clutching a kitchen knife. The man, believed to be a Muslim convert, dialled 999 and paramedics pronounced the girl dead at the scene. Police said next of kin have been informed. One elderly neighbour said last night: 'Nobody knew her very well but the children seemed very nice. However I used to be awoken by terrible screaming of a woman's voice in the middle of the night which was a regular occurence. Yesterday another shocked resident, a mum in her 30s, said the mother always wore a black headscarf with a veil. Ayatollah Seyed Hossein Kazemeiny Boroujerdi, a holy man, a long time vocal advocate of the separation of church and state and an opponent of the current regime in Tehran, is in dire circumstances as a result of long term imprisonment and physical and psychological torture. Reports indicate enduring the torture has caused Ayatollah Boroujerdi to lose much of his sight to the point that he is no longer able to even recognize objects and people around him. The regime has now decided to move this brave and tortured soul, along with six of his comrades to an undisclosed location. I, along with my freedom loving compatriots, express to you our gravest concerns regarding the future of this holy man. We beseech you to intervene before it is too late and prevent yet another crime by the Islamic Republic regime in Tehran. As we celebrate the anniversary of the Declaration of Human Rights, it is an affront to all to allow yet another egregious violation of human rights to occur in Iran. I must insist, on behalf of my compatriots and indeed civilized people the world over, that you and the community of nations stand up and demand the immediate release of Ayatollah Boroujerdi. Australian Prime Minister does it again!! Truer words have never been spoken. It took a lot of courage for this woman to speak what she had to say for the world to hear. The retribution could be phenomenal, but at least she was willing to take a stand on her and Australia 's beliefs. 'This culture has been developed over two centuries of struggles, trials and victories by millions of men and women who have sought freedom' 'We speak mainly ENGLISH, not Spanish, Lebanese, Arabic, Chinese, Japanese, Russian, or any other language. Therefore, if you wish to become part of our society . Learn the language!' 'Most Australians believe in God. This is not some Christian, right wing, political push, but a fact, because Christian men and women, on Christian principles, founded this nation, and this is clearly documented. Maybe if THIS message were to circulate in Europe, Canada & the USA , we will find the courage to start speaking and voicing the same truths. 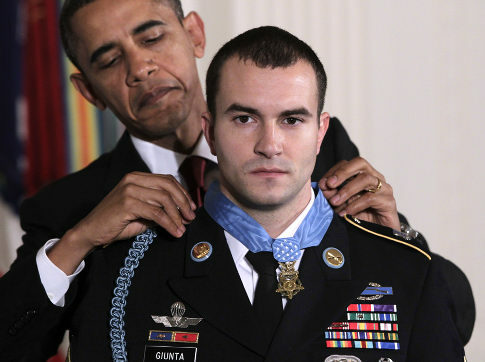 ﻿ LOOK AT OBAMA'S SNEER and watch the video below explaining how he put this hero's family back in the THIRD row behind Democrat Congress people instead of as guests of honor in the front row. 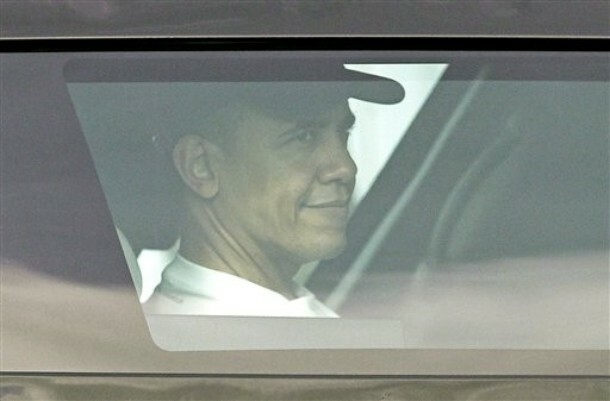 Obama shows his contempt for Congress and the Constitution and his ignorance. All this narcissist wants is to have his name on the START treaty. Bad for America? So much the better - two birds with one stone. This particular Ayatollah is the son of one of the late-Shah's most respected clerics and His Majesty would travel down to Qom to see the Ayatollah instead of having him summoned to the palace. Cleric Ayatollah Sayed Hossein Kazemeyni Boroujerdi advocates the removal of religion from the political basis of the Iranian state. We do not generally post petitions of any kind, nor have any ties to this cleric, but this petition included addresses and contacts that could prove generally useful for activists for Human Rights. BTW you will see two of the four Larijani brothers mentioned. These four all hold important, powerful positions in the Islamic regime (one is an ayatollah) and THEY are the reason that Ahmadi-Nejad firing the Foreign Minister Mottaki recently. He fell out with the Larijanis and that was the end of him despite his being protected by the Supreme Ruler Ali Khamenei. Indicates how powerful these IRAQI, not Iranian, born brothers have become! 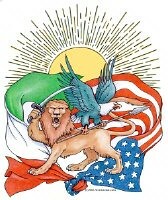 And how weak Khamenei. He has had to formally self-appoint himself as Allah's representative on earth and declare that failing to obey him fails to obey Allah just to retain sufficient influence against the Revolutionary Guard and the conflicts created in the rivalries of various senior clerics. Ahmadi-Nejad himself faces being removed and has to hang on desperately to his Revolutionary Guard past to stay in position after his Obama-like mishandling of the Iranian economy. Similary leading to enormous unpopularity among his former base of the "man in the street". SPECIALLY AS HE HAS JUST STARTED IMPLEMENTATION OF ENDING DECADES LONG FOOD and FUEL SUBSIDIES ON WHICH THIS SUPPORT BASE RELIES TO FUNCTION AND SURVIVE on a daily basis. Imagine the Obama regime stopping food stamps, MediCal/MediMedi and Assisted Housing here in America to get a feel of what this means in Iran. And it could happen. Some 40 million people rely on government handouts here in the USA. Some Latino organizations are apparently already calling for Civil Disobedience because the Dream Act (amnesty) was unable to pass in the Senate today. Riots could be a heartbeat away in both nations. With this in mind, note the likelihood of top Islamic regime and sensitive positioned persons begin riding around in fiberglass vehicles like Corvettes because you cannot slap a magnetic limpet mine explosive device to the body. 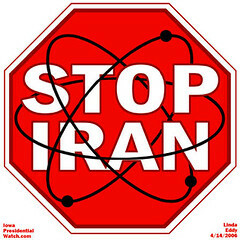 Recently, two if Iran's nuclear scientists were attacked by motorcyclists as they were driving to/from work in Tehran. The pillion passenger on the first motorcycle approached scientist #1's vehicle, clanged a magnetic explosive charge to it and drove off. Then used a remote trigger to set it off when they were safely away. The blast, reminiscent of magnetic limpet mines attached by frogmen under water to ships, killed the scientist. In the attempt on scientist #2 fairly soon afterward, the sound of the magnetic device being attached had him stop and exit running, so the blast failed to kill him. But another motorcycle with automatic weapons (Uzi?) sped by and loosed bursts at him. He was hit but appears to still be just alive in hospital. So finding non-magnet accepting vehicles may be among the top priorities there. Hard to defend against this effective hit and run, drive by assassination which takes a matter of some seconds to accomplish. Remote detonation can be done from the motorcycle as it is ALREADY escaping the scene. And gone before any escorts can react or prevent the approach from a side street, drive way or alley. While the late-Shah's bodyguards were very careful to clear or populate approaches for such possibilities well in front of the Shah's vehicle route, he eventually began taking helicopters. At least three in convoy without indication of which of them had the monarch inside. People like the scientists do not rise to the level of meriting helicopters - nor Corvette sports cars. Calling for them to be protected from torture or other ill-treatment while in detention and to be granted immediate and regular access to their families, lawyers of their choice and to adequate medical treatment. Married mother of one, Tayebeh Hosseini, aged 39, is a teacher and has a degree (BA) in English. Married mother of two, Maryam Azimi, aged 52, holds a BA in Persian Literature. Doctor Roya Eraqhi, aged 42, is a university professor and holds a doctorate (PhD) in Physical Chemistry. 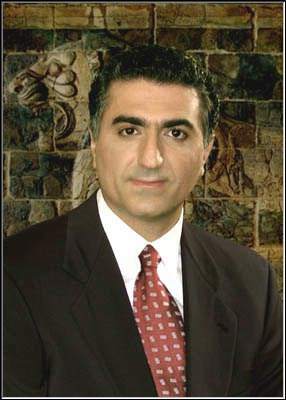 Former government employee, Mohammad Reza Sadeghi, aged 38, holds a master’s degree (MSc) in Computer Science. 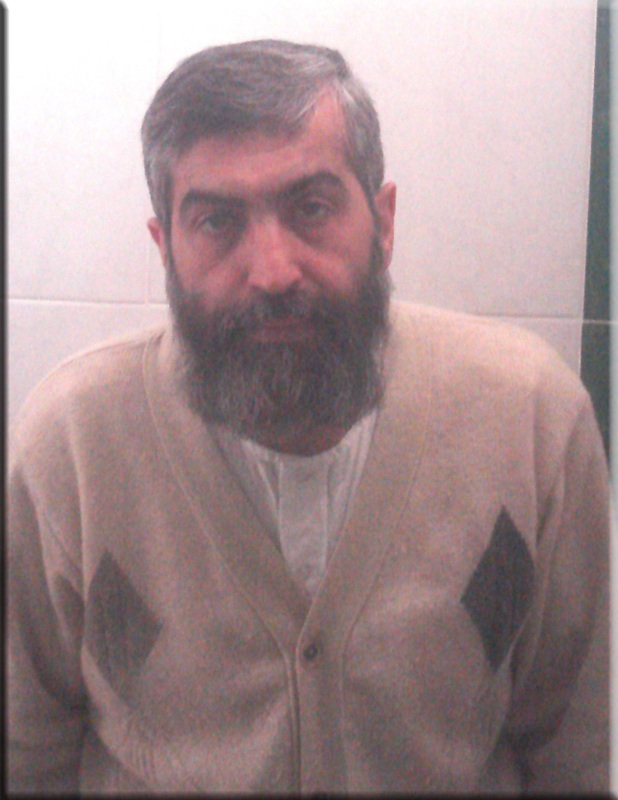 Mohammad Mehmannavaz, aged 39, graduated from Tehran technical college, and holds a BA in Construction Engineering; the Human Rights Activists in Iran NGO has reported that he was previously arrested on 27 November 2007 and detained in Section 209 of Evin Prison where he was tortured. He was released later on bail. Amnesty International has no further information about this incident. He was arrested at his home in Tehran on 8 October 2006 along with more than 300 of his followers. The prosecution initially sought the death penalty for him and 17 of his followers on vaguely-worded charges including “enmity against God”, but this was later dropped. He was convicted and sentenced to 11 years in prison, banned from practicing his clerical duties and his house and all his belongings were confiscated. On 27 September 2010, Ayatollah Boroujerdi wrote an open letter to the UN Human Rights Council calling on the United Nations “to investigate the abuses taking place in Iran and the Middle East as a consequence of intervention of religion into politics thus paving the way for the passage of a resolution supporting the separation of state from religion.” Please see: http://www.bamazadi.org/2010/09/boroujerdis-open-letter-to-un-human.html#more . The Special Court for the Clergy operates outside the framework of the judiciary and was established in 1987 by Ayatollah Khomeini to try members of the Shi’a religious establishment in Iran. Its procedures fall far short of international standards for fair trial; among other things, defendants can only be represented by clergymen nominated by the court, who are not required to be legally qualified. In some cases defendants have been unable to find any nominated cleric willing to undertake their defence and have then been tried without any legal representation. The court can hand down sentences including flogging and the death penalty.